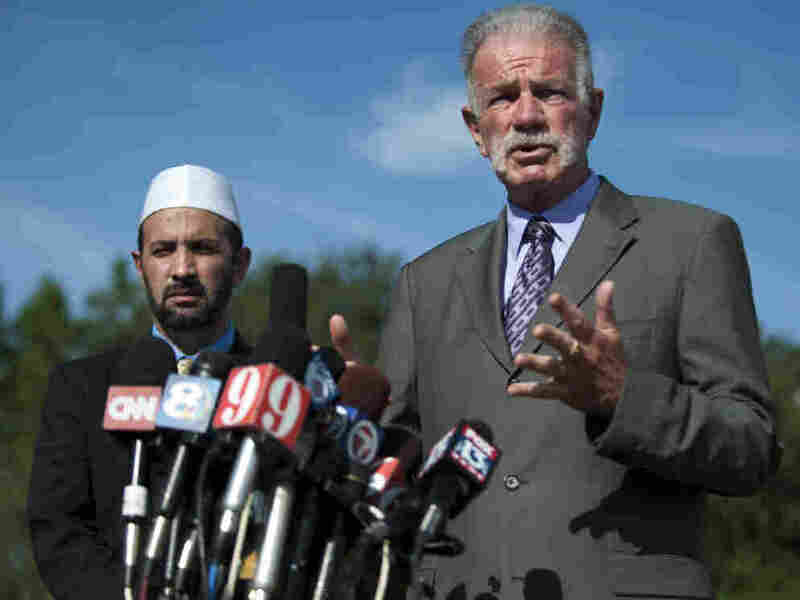 Florida Minister Reconsiders Quran Burning On 9/11 : The Two-Way Hours after he canceled the planned burning of the Quran, Pastor Terry Jones of the Dove World Outreach Center in Florida said he was rethinking his decision after the imam planning an Islamic center near ground zero denied any deal to move it. Updated at 9:10 pm ET -- NPR's Greg Allen is reporting that Wayne Knapp, the associate pastor of the Florida church, has said the Quran burning scheduled for Saturday was postponed until the proposed meeting in New York is confirmed. The church will wait 24 hours to confirm the meeting will take place before making any further decision about the Quran burning, Sapp said. Meanwhile, The Associated Press is reporting that the Rev. Terry Jones, is now threatening to reconsider burning the Quran on the anniversary of the 9/11 attacks. He is accusing Imam Muhammad Musri, the president of the Islamic Society of Central Florida, of "lying" to him about moving the proposed Islamic center and mosque away from New York's ground zero. Updated at 6:29 pm ET -- We reported earlier that the real estate developer and entertainer Donald Trump offered to purchase what was called a major stake in the Park51 site of the controversial Islamic center near Ground Zero from investor Hisham Elzanaty. Wolodymyr Starosolsky is a lawyer for the investor in the real estate partnership that controls the site. He says Trump's offer is "just a cheap attempt to get publicity and get in the limelight." Trump wanting publicity and seeking the limelight? Starosolsky won't get much an argument from many people on that one. Updated at 6:20 pm ET -- In a statement, the developer of the controversial Islamic Center in New York, directly contradicted Terry Jones, the Florida preacher who said he cancelled his incendiary plans to burn Qurans, claiming he had an agreement with those behind the Lower Manhattan facility that they would move their building. "It is untrue that the community center known as Park 51 is being moved. The project will proceed as planned. What is being reported in the media today is a falsehood." The Pentecostal preacher who caused world wide outrage with his plan to torch Qurans on the ninth anniversary of the 9/11 Saturday, said he was calling off plans to burn the holy books. Terry Jones, pastor of the Dove World Outreach Center in Gainesville, Fla., said he decided to cancel his planned Quran burning based on a deal he claimed was reached with the Muslim cleric behind the planned Islamic Center near Ground Zero in New York to move the controversial building to another site. But NPR's Margot Adler reported from New York that sources told her that there was no agreement to move the Islamic center. Margot's report was echoed by other news reports. Confusing matters even more, real estate mogul Donald Trump made an offer to purchase a major stake the Lower Manhattan site where the Islamic Center would be built from its current owner. And there were indications that they Egyptian-born businessman he approached might be receptive to such an offer. At a news conference, Jones plainly said that Feisal Abdul Rauf, the imam behind the Islamic center in New York, had agreed to move the center's future location farther away from the place where the World Trade Center towers fell. "The iman (sic) has agreed to move the mosque. We have agreed to cancel our event on Saturday and on Saturday I will be flying up there (top New York) to meet with him." But Musri, the imam in Florida later told CNN that there was no agreement. Rather, he said he believed Rauf was open to discussions. Meanwhile, Trump offered $6 million to buy a major stake in what's called the Park51 site from businessman Hisham Elzanaty. That amount is far less than Elzanaty indicated he wants for his stake. But he has indicated a willingness to sell it.